I often refer to James Tenney's collage compositions, when referring to the fact that artists have been sampling pop music since the very beginnings of pop music. Tenney worked on "Collage #1 (Blue Suede)" in an electronic music studio at the University of Illinois (Champaign-Urbana) in 1961, just five years after the release of “Blue Suede Shoes,” the Elvis Presley record which gets sampled in the piece. Another Tenney collage is a bit longer, and composed a bit later (in 1967). "Collage #2 (Viet Flakes)" is also the soundtrack to a film of the same name, by Carolee Schneemann. The film is a collage of violent images from the Vietnam War, while Tenney’s composition collages bits of audio from sources such as Vietnamese and Classical music, along with American Pop music. *Tape manipulations, digital deconstructions or turntable creations: Both Blue Suede and Viet Flakes were created with magnetic tape editing techniques, cutting and splicing. The works juxtapose and combine pre-existing (and often familiar) sounds and excerpts of songs. These two pieces stand out from Tenney’s other compositions, which were largely instrumental or used computer-generated sound. They show his interest in popular music and, in the case of Viet Flakes, his interest in interdisciplinary art forms—the piece was originally the sound component of a performance piece by Carolee Schneeman. *Creative/artistic background: Tenney’s work deals with perception, just intonation, stochastic elements, information theory and arch form, which he referred to as “swell.” He studied information theory under Lejaren Hiller and composed stochastic early computer music, eventually becoming very focused on writing for instruments, utilizing tape delay and alternative tunings. He performed with John Cage, and with the ensembles of Harry Partch, Steve Reich and Philip Glass. In the sixties, he worked with Max Mathews at Bell Telephone Laboratories, developing programs for computer sound-generation and composition. An entire issue of of the academic journal, Perspectives of New Music, was devoted to his music, in 1987. *History: Tenney was born in Silver City, New Mexico and grew up in Arizona and Colorado. 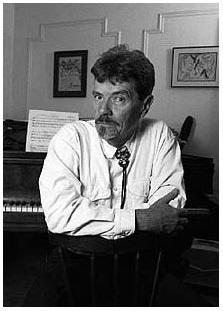 He attended the University of Denver, the Juilliard School of Music, Bennington College and the University of Illinois. He studied piano with Eduard Steuermann and composition with Chou Wen-chung, Lionel Nowak, Dorothy Taubman, Paul Boepple, Henry Brant, Carl Ruggles, Kenneth Gaburo, Lejaren Hiller, John Cage, Harry Partch and Edgard Varese. He taught at the Polytechnic Institute of Brooklyn, the California Institute of the Arts, the University of California and York University in Toronto. Tenney died in 2006 in Valencia, California. *How would you like to be remembered: Tenney will be remembered as an influential music theorist, and composer.